In the town of Mahatao in Batanes is a house of stone, the only one left behind by the steady march of progress. We stopped to take some pictures, but it was those taken inside that I thought were more fit to become this week's postcard. The stone house is over a hundred years old, with a leaky grass roof that stained the walls inside. The floor still had some tarred planks, well worn by generations that lived there, but momentarily covered by modern vinyl. On one end of the room, a blackened round wok sits atop a stone embankment, with a crude grill nearby. There's a mound of coconut shells for starting a fire, as well as a pile of firewood to keep the flame going. 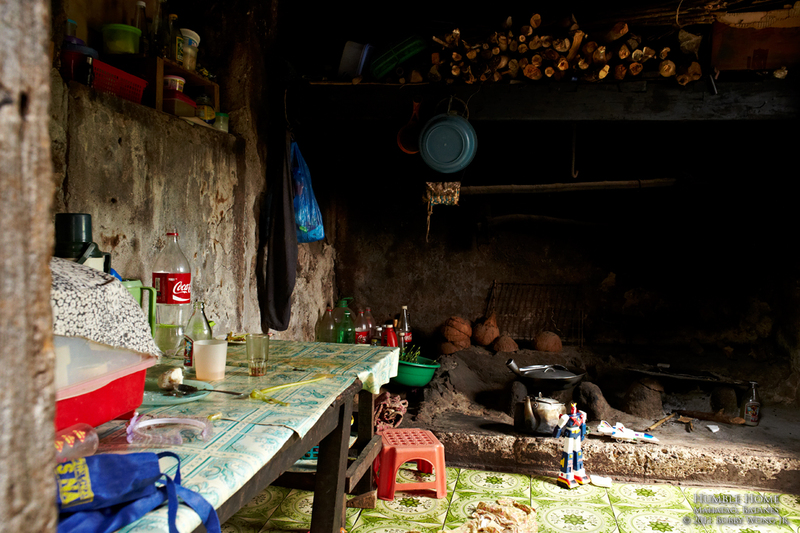 They mostly grill or boil their food because cooking oil is a luxury. On one side is a small table where they keep everything they own. The center of the room is where they alternately eat, sleep, and live. You can tell some modernity has arrived: plastic pails, bottles, basins, chairs, and toys. Where the past meets the present, it's still out there if you look hard enough. Enjoy. Sometimes, the feel of the far antiquated past in your surroundings can be relaxing. A stone house may not be as comfortable as modern houses, but it gets you somehow connected to its ancestral origins. I like how you described that house. It's very old but it looks nice. I should probably consider going there. Thanks for sharing this photo of a simple stone house. You've never been to Batanes if you don't make the trip to Sabtang Island. In Sabtang, you get to visit the traditional villages of Savidug and Chavayan where you can have the chance to walk around the barangay (community) and marvel at all the centuries-old Batanes stone houses that comprise the village. Thank you for sharing this. This stone house though it is old it can last thousands of years. The photo shows how people live in a hundred-year-old house. It's just amazing how they were able to maintain the house for a long period of time. That was a very long time. I can't imagine how they maintained that place. I'm glad I saw your blog. It's very inspiring. This is so cool. I am such a huge fan of their work. I really am impressed with how much you have worked to make this website so enjoyable Thanks for it!! !